Joint pain and swelling in the pediatric age group is a clinical challenge. It may be a manifestation of a benign disorder such as growing pains or an indicator of serious systemic disorder. We report a child who presented with multiple joint swelling and was finally diagnosed as progressive pseudorheumatoid dysplasia (PPRD). A 10-year-old girl presented with complaints of symmetrical swelling of small joints of the upper limb-both distal and proximal interphalangeal joints and later involvement of bilateral ankle and right knee gradually over the past 5 years. For the last 6 months, the child had hip pain and was unable to walk. Clinical examination revealed camptodactyly and restriction of movements in the same joints, but no redness/increase in local temperature. Blood examination revealed normal erythrocyte sedimentation rate, C-reactive protein, and rheumatoid factor. Radiographs of the hand and the wrist showed generalized osteopenia but no erosive lesions. X-rays of the spine revealed platyspondyly with anterior beaking in the lower thoracic and upper lumbar vertebra. 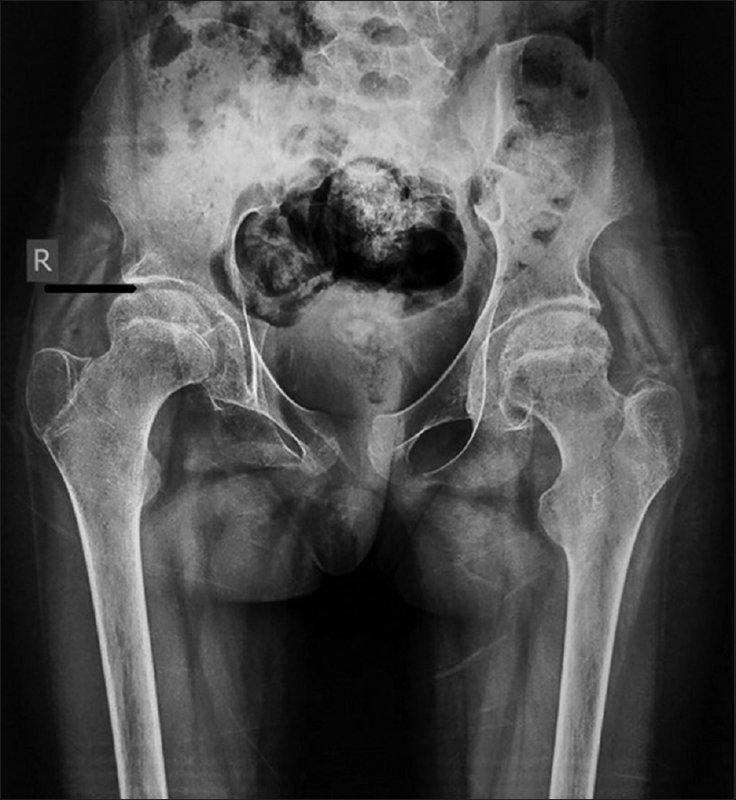 X-ray pelvis showed narrowing of the hip joint spaces bilaterally with flattening and irregularity of the femoral heads more prominent on the right side [Figure 1]. She had many oddities for the diagnosis of juvenile Idiopathic arthritis (JIA) as to the pattern of joint involvement, no erosions, negative for markers of inflammation, and no response to anti-inflammatory medications. She was a case of PPRD. PPRD is an autosomal recessive disorder; usually manifests between 3 and 8 years of age with symmetric polyarthralgia with nonsynovial swelling of the proximal interphalangeal joints, elbows, knees, and ankles. A reduction in joint mobility and multiple contractures lead to severe disability. Short stature is a consistent finding which results from spinal abnormalities. Genetic alterations in the WISP3 gene, located in 6q22 which encodes proteins which are expressed in synoviocytes and chondrocytes have been implicated in the pathogenesis of PPRD. We thus conclude that the pattern recognition of symptoms is important for a clinician as PPRD is an important mimicker of JIA. Appropriate X-ray, especially of the pelvis and spine, can give an important clue to diagnosis. Bennani L, Amine B, Ichchou L, Lazrak N, Hajjaj-Hassouni N. Progressive pseudorheumatoid dysplasia: Three cases in one family. Joint Bone Spine 2007;74:393-5. Duarte-Salazar C, Santillán-Chapa CG, Martínez-Coria E, Marin-Arriaga N, Miranda-Duarte A. Pseudorheumatoid dysplasia. A rare genetic disorder simulating juvenile idiopathic arthritis. Reumatol Clin 2013;9:316-8. Adak B, Tekeoğlu I, Sakarya ME, Uğraş S. Progressive pseudorheumatoid chondrodysplasia: A hereditary disorder simulating rheumatoid arthritis. Clin Rheumatol 1998;17:343-5. Dalal A, Bhavani G SL, Togarrati PP, Bierhals T, Nandineni MR, Danda S, et al. Analysis of the WISP3 gene in Indian families with progressive pseudorheumatoid dysplasia. Am J Med Genet A 2012;158A:2820-8.